As a junior mining newsletter writer in the 2000s, Paul van Eeden made shareholders a lot of money with astute, well-reasoned picks. Now he plans to repeat the feat as executive chairman of Synodon (SYD-V), a remote sensing company that uses aerial surveys to detect pipeline leaks. The technology was developed by the Canadian Space Agency and purchased and refined by Synodon. Van Eeden thinks the hit-and-miss nature of current methods of detecting leaks has opened up a unique market opportunity for the Edmonton-based firm. 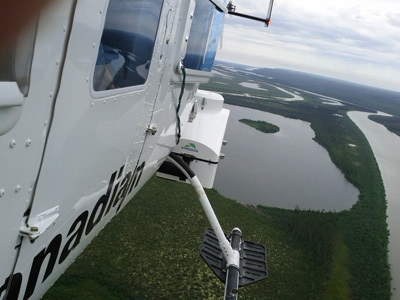 A recent U.S. study found that visual aerial surveys – somebody looking out a plane window for vegetation damage – were more likely to detect pipeline leaks than built-in leak-detection monitors that measure pipeline flow rates. And members of the public are more likely to find pipeline leaks than the aerial surveys. “It illustrates the fact that the industry as a whole needs to find a new method of leak detection,” van Eeden said. Existing leak-detection systems inside pipelines can’t measure small leaks, but those small leaks can quickly become big if undetected. For example, a July 15 leak in northern Alberta dumped 5 million litres of bitumen, sand and water over a period of two weeks before it was discovered by a member of the public. A warning system in the new pipeline failed to detect the leak. When things go wrong, it means damage to the environment, lost revenue for the company and potentially – particularly on high-profile oil spills – huge damages to both reputation and market capitalization, van Eeden noted. Synodon’s clients include major oil and gas companies. Synodon shares have been pummelled along with almost everything else on the TSX Venture – the stock is down 70% YTD. So what’s the value proposition now? A restructuring over the past year has seen new management installed, costs reduced and a shift in focus from science to commercialization, van Eeden said. Last month Synodon raised $2.94 million in a rights offering, with proceeds going to purchase more leak-detection instruments and generate more revenue. At the end of 2011 he wrote a fairly large cheque and came away as a 20% shareholder. He’s been financing it since, including in the rights offering, and his equity stake has grown to almost 40%. Van Eeden believes a restructured and recapitalized Synodon is in a sweet spot both operationally and in terms of environmental awareness and social license. The investor worked as a broker for Rick Rule at Global Resource Investments before launching his newsletter in 2002. He sold the newsletter to Brent Cook in 2008 and is now president of Cranberry Capital, a private holding company. Van Eeden gained acclaim for his research on the gold price, inflation and currency markets, which is detailed on his personal website: www.pve.net. He told me that in 2016 he expects more volatility and downward pressure on gold and commodity prices denominated in U.S. dollars. While growth in the U.S. economy is tepid, it’s outperforming all other major global economies, so he thinks the USD rally is not done yet. Van Eeden declined comment on his other public-company ventures – he is chairman of Evrim Resources (EVM-V) and Kobex Capital (KXM-V). Van Eeden recently did a couple of great interviews on the fair value of gold with Albert Lu’s Power & Market Report. Check those out here. Join the conversation daily at CEO Chat, the investment conference in your pocket. This is not investment advice, and all investors need to do their own due diligence and own their trades. Author has no position in Synodon.